Camino Lola: Day 23: Ohhhhhhh Cebreiro! In any case, yesterday I went up to the highest point: O Cebreiro... And I kept thinking that people must add O! to the Cebreiro (as in 'Ohhhhhh! Cebreiro') because its a tough hike - up, up, up about 900m in altitude within 11km. That's enough to illicit an "O!" 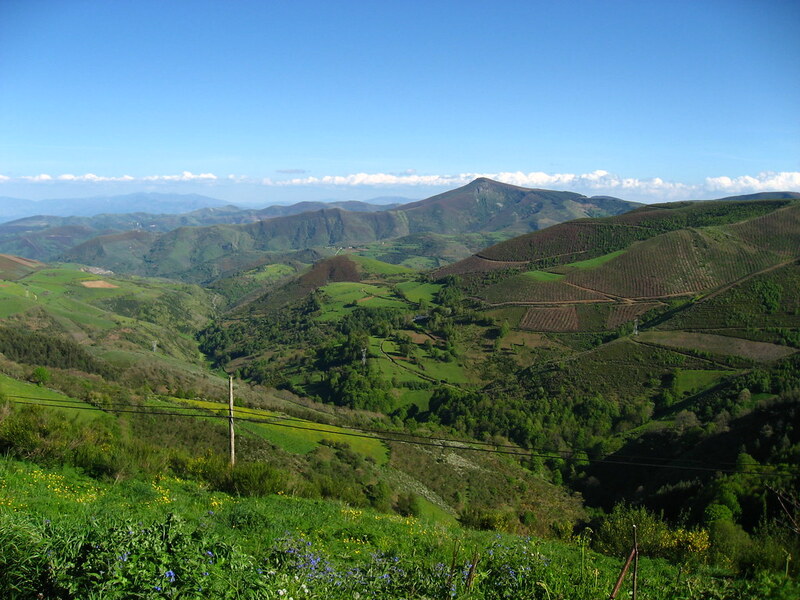 Along the way, the region changes from León to Galicia, and the atmosphere becomes very Celtic. As I arrived in O (Ohhhh!) Cebreiro bagpipes were blaring out of the local shop, which was laden with Celtic knots and silly fake pilgrim walking sticks, crappy tee shirts, and just about anything useless covered with or in the shape of a scallop shell. It was nice small village but totally built for tourists. The sheer number of German tourists that streamed from the bus and were photographing the view was overwhelming to say the least. In my guidebook, the albergue at Ohhhhh! Cebreiro is described as modern with 80 beds a kitchen, etc. Since Cardeñuela & Rabe, I have learned not to take my book as 100% accurate. Turns out the albergue was in shacks (like the ones schools use as extensions or the metal sheds they use up North in Canada) and the facilities (showers & hole in the floor toilets) were less than desirable. The hospitaleras were leaving for lunch just as I arrived, so it was an hour & a half later before me and several others were even registered. I attempted to look around for a hostal as an alternative and it was BRUTAL: 43 euros was the lowest for two persons (not even a single room)... Because I had splurged on a beautiful hostal the night before, I decided to go back to roughing it. Again, I am a pilgrim and I am grateful for the bed, a shower and a place to hang my clothes. There can be no choosy stuff as a peregrina. Well... I have realized I am quite a clumsy girl. I fell for the FIFTH time on this trip, but this time IN THE BAR. Down I went, along with a (thankfully empty) wine glass & a bowl of peanut shells - everything smashed to bits on the floor. I cut my left knee exactly where the old wound had healed. Argh! And I had *just* given away my betadine and bandages to blister ridden Jean-Pierre from France maybe just an hour before. The barman on duty went to fetch some help, & two very nice women (one who seemed to work at every place in town) cleaned the wound and bandaged it up for me. It'll heal - it wasn't deep like my right knee, just embarrassing because I'm starting to think I have a strange difficulty with my legs on occasion. Later, I had way too much wine, which became obvious after I got into bed to write some more, and promptly passed out. Woke up at 1am and realized my stuff was all disorganized & so I started trying to put stuff together as quietly as I could. I have to say I slept pretty deeply, as I didn't hear a thing while I had slept and I wasn't even wearing my earphones. about 16km on the highway from Villafranca del Bierzo.